Tools for statisticians tend to be anything but intuitive, so in 2012, the Y Combinator-backed Statwing set out to bring the power of these tools to the masses without bogging them down in arcane interfaces and terminology. Today, the service is launching a new partnership program that will allow web apps to embed the service’s tools, as well as a new round of funding. The new funding round, the company told me, was an angel round for a few select investors: Cloudera Founder Jeff Hammerbacher, Slicehost co-founder Jason Seats, IndexTank founder and CEO Diego Basch, echolibre co-founder David Coallier, Matthew Kimball, Juan Luis Vicente and Redbooth COO Juanjo Matam. Statwing, however, refused to disclose the total amount of this round. This is the first time the company has raised funding since it graduated from Y Combinator. As the company told me, the plan is to use the additional funding to grow its development team. With its new partnership program, the service wants to bring its tools, which make it extremely easy to analyze and visualize very large amounts of data, to a wider audience. Using Statwing’s API, they can either embed the service directly on their own sites or have users access it through a [partner].statwing.com URL. Statwing offers a free — Statwing-branded — version of this service, as well as a paid white-label tier that removes all of the company’s own branding. Statwing is gearing its service toward business users who have to quickly understand large data sets. 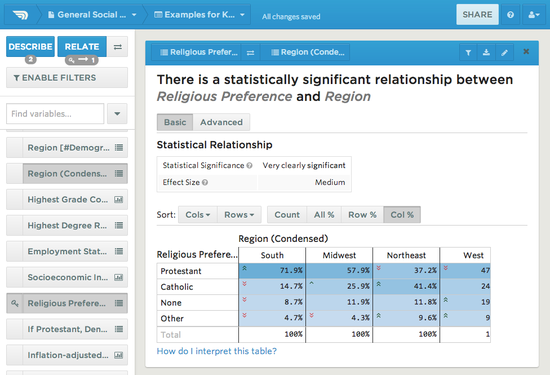 With just a few clicks, the service lets you find correlations in your data and create charts and graphs. Since its launch in 2012, the team completely overhauled its user interface from what the company itself described as “poor” to today’s more intuitive version. To do this, the company brought in former TiVo designer Bob Vallone. In addition, it can now easily handle larger data sets. At the beginning, the limit was 5MB, but today it can easily handle up to 500MB.